A patient with carcinoma of the biliary duct developed cholestasis. Initial CT and MRCT show dilated biliary ducts with intraluminal mass in the common bile duct. Because of failed ERCP due to stenosis of the duodenum, PTC (percutaneous transhepatic cholangiography) was performed. The procedure itself was successful and resulted in decompression of the biliary three. However, large intraparenchymal hematoma developed as a complication. 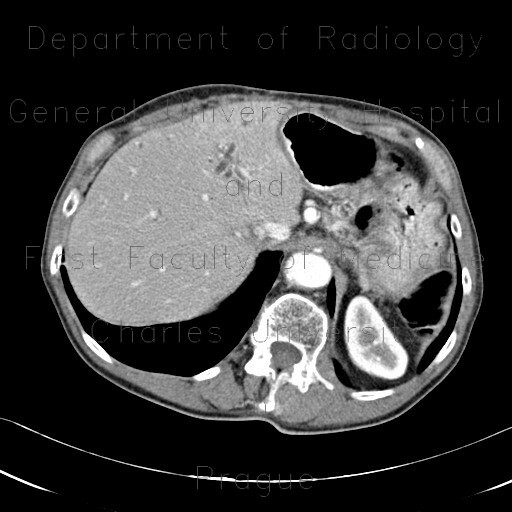 The final CT shows massive hematoma in the liver parenchyma that contains blood density as well as high density contast leaking from an injured vessel. The CT also depicts position of the PTC drain and stent in duodenum.